Yesterday afternoon I went to a nearby cafe to do some writing; after I finished my pages I ended up sketching the interior of the place for about 35-50 minutes. Pretty damn pleased with the sketch, even if some of the lines and proportions are goofy. I’d like to do more working in cafes, libraries, and other public spaces from here on out. I’ve noticed my mood has been a little more volatile lately; I’ll feel great in the middle of the day, and then kind of depressed by bedtime. Yesterday I spent the entire day indoors. When I left the apartment today to walk to the cafe, I was surprised by how sunny it was outside. Then I realized I should probably be getting out more, now that we’re living in a basement apartment. Today I plan to try for a free noon concert and another go at the St Lawrence Market. Mixed diary: free live music! Hooray! 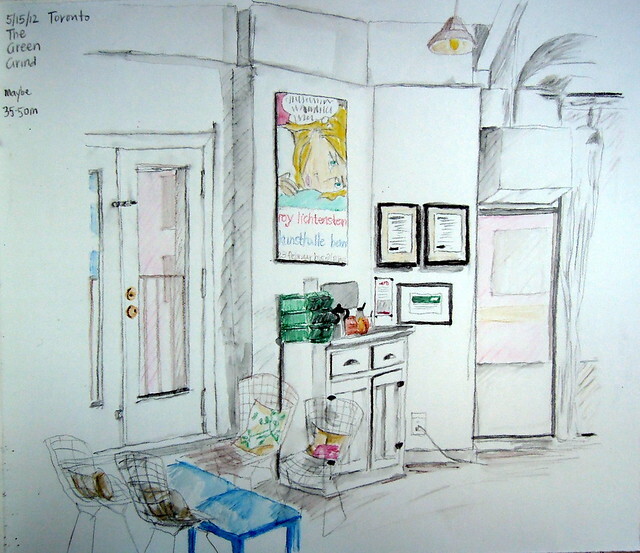 Fantastic work Lisa, once glance and i feel like i know what this coffee shop looked like! that is pure success!